We’d love your help. Let us know what’s wrong with this preview of Rise of the Storm by Christina Ochs. Prince Kendryk is young, handsome and popular, his kingdom prosperous and peaceful. But in the face of the prophesied apocalypse, he must choose between conscience and power. If he chooses the side of faith, he must defy the ruthless Empress Teodora, ruler o When a renegade priest prophesies an imminent apocalypse, a conflict is sparked which will tip a continent into war. To ask other readers questions about Rise of the Storm, please sign up. Honorable Heros-No Rakes & No Cheaters! This is a fantasy novel that has a historical flare, but doesn't take place in any specific time. The entire world is fiction but you can see that the author draws upon an ecclectic mix from real world time periods. The tale at it's most basic is one of good versus evil. A cruel emperess who is constantly overreaching her authority over other lands. She is like a spoiled child who needs to always get her way. She rules with an iron fist and although many of the lands princes do not like 5 stars. The tale at it's most basic is one of good versus evil. A cruel emperess who is constantly overreaching her authority over other lands. She is like a spoiled child who needs to always get her way. She rules with an iron fist and although many of the lands princes do not like her, they fear her and her retribution for non compliance. Prince Kendryk is a man of intellect and strong faith, and avoids conflict at all costs, until he meets an intriguing radical priest. Soon after defending this radical priest against the empress, Kendryk finds himself and his lands threatened. Thanks to his intelligent, and spirited wife, he will now have to do the unthinkable...fight! We also follow the story of Janna who escapes her town when the empress's armies crush a rebellion there. She leaves with her stepson and daughter only to head into further peril. There are others that we see through their eyes, but you will have to see that for yourself. I really like this story, alot. It is structured similarly to Game of Thrones where each chapter is a peek into a different characters perspective of the stuggles going on politically in their world. The writing is very good, and there are little editing issues. There is some romance, but it is not a romance book. The romatic parts are not depicted in detail. This is a "clean" read. I personally don't mind, the story itself is so good I don't miss it. The complex characters are developed slowly, and there is little physical description of them. The physical enviornment as well as the land and atmosphere are also loosly described. I found this not to be a bad thing because it allowed my imagination to take over. The author gave just enough to give the reader a sense of how people and places look, allowing for us to create it for ourselves in our own minds. Most of this book (book 1) is spent as build up so to speak. It is never boring nor did I find myself skimming. Towards the end, the conflict picks up and the action begins. This is a cliffhanger so you have to continue with the second book to find out what happens (which I am doing right now). I highly reccommend this to those who like fantasy books regarding political and religous struggles. it also seems there is also a hint of light and dark interwoven and subtly into the theme. FYI - the second book is action packed and I can't put it down right now. Sprawling, fascinating, complex fantasy based on the beginnings of the 30 Years War. Young Prince Kendryk, the popular ruler of a peaceful land, must choose whether to follow his conscience and embrace the teachings of a radical priest who warns of a coming apocalypse, even though it means defying a ruthless Empress. As the empire and surrounding nations spiral down to war, Kendryk and a number of other memorable characters must find a way to survive and to fight for what they believe is right. Cousin to the enraged duke, Kendryk is among the people of his elderly cousin's fiefdom to hear what it is the priest, whom has so angered his cousin, speaks of. If first impressions are anything to go by, the assumption of piety appears intact. Kendryk has certainly never before encountered a priest who'd forego worship in their revered temples, or for that matter, carry their own box to stand upon. So as to give their speech greater reach from a location outside the temples, where more can hea Cousin to the enraged duke, Kendryk is among the people of his elderly cousin's fiefdom to hear what it is the priest, whom has so angered his cousin, speaks of. If first impressions are anything to go by, the assumption of piety appears intact. Kendryk has certainly never before encountered a priest who'd forego worship in their revered temples, or for that matter, carry their own box to stand upon. So as to give their speech greater reach from a location outside the temples, where more can hear their assumed wisdom. Landrus, representative of the orders of the High Temple and the Imperata was by definition speaking heresy. Not in the way one usually encounters heretical preaching though. He spoke not of turning away from, or worse, turning to alternate gods. No, in a manner similar to the fall of the deities of Olympus, Landrus speaks of the decline in power from a halting of correct worship brought about because of the organisational aspects of worship; the self-serving ways that those of power use worship and faith to furnish their own ends. The purpose is not anarchy but savour, for he also highlights that should the gods and goddesses (The High Family) continue to weaken, then the encroaching war with darkness will be lost. Why at that moment Kendryk would choose to intercede would be a quandary for later, he just knew deep inside that he needed to stop his cousin from arresting Landrus; when the duke chose that meeting to appear in the crowd and misuse Kendryk's princely authority and name to support his arrest, the prince knew had not given that authority. The abuse of his name without consultation did gall him though. Kendryk's efforts to ensure he understood the priest's position before he would condone arrest for heresy in his name, would not however be repaid by a settling of his conscience. That the holly scripts spoke of a final battle between light and dark was as troubling as the Imperata's control over who may read those same scripts; and perhaps worse still, control over what interpretation can be spoken of. Surely if such a malidiction was approaching, irrespective of how many agreed or disagreed with such interpretations, the salient thing to do would be to open this for intelligent debate; not to close shop on the matter and execute under the auspices of heresy? All too often are those that speak of authority being held by the gods and goddesses, not the institutional representatives, executed for heretical preaching. Kendryk now faces a great crossroads, whatever road he chooses will inevitably place him in contention to one or more authorities, for his own is not absolute. Elsewhere other rebellions against the empress are being put down, most often in places capable of only a token resistance to the law-and-order sent to put an end to this action. The latest city had a reasonably defensible geography and battlements, but lacked the numbers and training to truly put to test the approaching divisions sent by the empress. In typical fashion when rewarding the recovery of pieces of an empire, the grunts earning a meager or non-existent wage, hardly worth the risks to life and limb, are for a period allowed to sack the city. Whilst husbands, brothers, uncles, sons, and so forth, are either being carried to funeral pyres, or trussed off as prisoners of war, wives, mothers, and daughters are being raped by those less interested in loot than the other forms of payment on offer. The only thing missing from such scenes, is the rationale behind the desperate actions of mostly farmers, labourers, and perhaps a token number of city guards; for those employed in the empress's forces with any conscionable sense of right and wrong must surely ask what it is that causes such people to throw away their lives in untenable revolts. The propaganda spouted by an empire can never fully encompass or admit to the real reasons for such as this. For a kingdom to simultaneously have cities rising up in insurrection and members of the clergy preaching knowledge tantamount to heresy, it doesn't take a wise or even particularly well informed representative of the state to consider, or better yet determine, that a sickness exists within it's ranks. Too often do powerful rulers and nobility send out power hungry zealots eager to complete mandates handed down, without first establishing the truth behind said claims, or why they exist in the first place. Prince Kendryk, as readers now know his status, is a true noble of the people and of faith in The Holy Family. He makes no abuses of power, and abides no lies to be said in his name. Reaching the final battle is not necessary for there to be components of what the defenders of truth dread the most to become evident in dealings with the empress, she already makes unchecked abuses of her authority, but too few are prepared to against her. The darkness present in her lackies speaks well enough to the possibility that Teodora too has fallen under the influence of those the gods would seek to stop. The forces of darkness in a vision given to Kendryk, will employ creatures not only of man, some that are a combination of both. The right hand of Teodora, a lieutenant she commands, is definitely what makes up aspects of the horde. Contrasting the high road wheeling and dealing of the nobility and rulers of the kingdom, is the plight and experiences of a widowed mother with two step-children in her care. Janna, her husband captured and likely executed for his role in one of the minor rebellions, was forced to abandon her city home in an attempt to flee to distant relatives. The road is long and riddled with others fleeing and unscrupulous soldiers who look to take advantage of the disarray. Janna is first forced to give up everything they managed to flee with in order to avoid the sorts of things young attractive women face on the road, when they have only two children accompanying them and no one to protect their virtue. Accustomed to a certain standard of living, the harshness of the roads between villages, towns, and cities, where law and order is often whatever those with the numbers, weapons and power says it is, the experience takes a continuing greater toll. Outside of the devastation by pillage and plunder, as it is witnessed by commanders of forces involved, this latter aspect of the story works well in prompting considerations of the wider consequences. It also gives a very human face to an empire bordering a loss of control over law-and-order. Whilst corruption might exist in those controlling society, as long as the overt face of these problems isn't found to be too extreme, then most people will support the status quo. The extreme losses by those trying to fight for a better tomorrow are often seen as the greater evil: its how corruption seems to grow and remain unchallenged. Idealism and the fight for truth seems to be the hardest road, those with power don't want to lose, and those with a taste want more. Even the good among the bad still see the status quo as the least painful option. Re-reading the entire series to make sure I don't leave any loose ends in the last book. The typos though, ARGH! Loved this multiple genre adventure! The characters and plot are genius and I am officially hooked to this author! Thanks for the ride Christina Ochs and am so looking forward to more! I was fortunate to receive a free copy from the author through Voracious Readers Only. The prince faces a dilemma - listen to the prophecy, save his people long term lose his power and that of the other nobles or retain the status quo and to heck with the prophecy. It was a good idea, but the story changed characters every single chapter. Just as I started to care about a particular situation or person, I'd have to stop reading about them and get started with a different person. Rise of the Storm by Christina Ochs is an epic fantasy novel that follows the lives of several characters in an empire increasingly devastated by war and rebellion. With a full cast of characters, political intrigue, romance and a dash of violence, it has everything sword-wielding fantasy lovers crave. 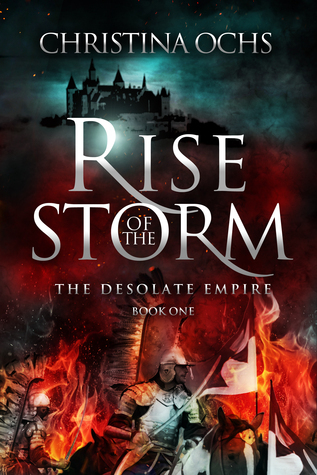 In Rise of the Storm , the chapters rotate between the perspectives of four characters: Prince Kendryck, Disclaimer: I received a free electronic copy of this novel in exchange for an honest review. In Rise of the Storm , the chapters rotate between the perspectives of four characters: Prince Kendryck, Princess Gwynneth (Kendryck’s wife), Braden (a military general), and Janna (a commoner). This structure allows the reader to see the empire and its battles from multiple perspectives, which works well for both delivering information and creating strong emotional experiences. The reader will be rooting for characters on opposite sides of the war, which elicits fantastic tension. Likewise, the chapters are rather short. Personally, I enjoy short chapters as a reader - it makes me feel like I’m moving along in the story and encourages me to read “just one more” before putting the book down. All of the characters and their relationships are well-developed. Ochs provides enough background to give the reader a sense of the characters’ worldviews, while also allowing them ample opportunity to grow in the face of challenges. Seeing the characters develop (even when I don’t agree with what they’re doing) is satisfying. They feel like real people, flaws and all. From a thematic standpoint, Rise of the Storm deals with several serious themes. Much of the driving force behind the war is related to changing theological views within the empire, and Ochs explores religious freedom, persecution, and religion as a reason for war. Moreover, Ochs deals with feminist issues, such as violence against women and women’s roles in this society. Obviously, this theme is explored from the society’s matrix, but Ochs does a great job of developing strong female characters and helping them overcome adversity. Last, Rise of the Storm introduces political themes as it shows where characters allegiances lie and why. My only critique of the novel is that I feel like the reader is thrown right into the action without much explanation. For example, there are plenty of characters that are never met but that are mentioned by main characters. Often, the reader is left wondering who these people are and how they are connected to the characters. Similarly, I felt the governmental and theological structure of the world could have been better explained. While pieces were revealed throughout the novel (which is preferable to an information dump in chapter one), I still feel like I don’t fully understand who is in charge of what and how the hierarchy of power works. That being said, this confusion did not detract from my enjoyment of the novel or comprehension of its plot, but I do feel like I missed a little depth. This book has a lot to recommend it. It is fast-paced and always exciting. The plot is detailed and convoluted, and the fantasy world is drawn out in an interesting way. I wish the chapters had a little bit more meat on them. As fast-paced as they are, prompting me to turn pages quickly, they were done in a flash. A lot of detail was left out that could have brought the setting and the characters to life. I found it difficult to connect with the characters in so short a timespan, and part of tha This book has a lot to recommend it. It is fast-paced and always exciting. The plot is detailed and convoluted, and the fantasy world is drawn out in an interesting way. I wish the chapters had a little bit more meat on them. As fast-paced as they are, prompting me to turn pages quickly, they were done in a flash. A lot of detail was left out that could have brought the setting and the characters to life. I found it difficult to connect with the characters in so short a timespan, and part of that was the fact that I couldn't visualize them at first. It was a particular pet peeve of mine that scenes were cut short and then continued where they left off down the road when they could have been completed. I expected a timeline in which this all happens at the same time, and we flip between characters to see what they're doing at that point in time, but that was not true. As one scene continued from the beginning dictating the passage of an hour or two at most, in another character's point of view an entire day passed. This made it difficult for me to ground myself in the narrative. This is quite involved and complex but I really enjoyed it. There are a lot of threads that have to be brought together but it never seemed too confusing. I really liked the world building and the different cities and cultures. It was very vivid and I could easy imagine all the places described. I love stories that gave a renaissance feel as well which this one did. The characters were good in this one although there were a few I didn't really connect with. Kendryk is good but it took a while for me to warm to Braedon and Janna. The same for Landrus as I didn't really like some of his characterizations (the same for Gwyneth) . Teodora is wonderfully crazy and petulant, Count Faris is very noble and staunch and Daciana Tomescu is just evil personified. Overall though they really work well together as a cast. The plot is complex but not overly so and there are lots of twists and turns (almost to the last page ) The action comes thick and fast and is long enough but not too long. Things move along at a good pace. 4 1/2 STARS!!!! Really good read!!! If you like history and historical fiction read this! I probably would have given 5 STARS, but the story has so many characters and is written alternately in each of those characters viewpoints and many various sites it took some effort to keep them all straight. That being said, I'm writing this review after reading book 2 which is even better, having gained a grasp on all the players. Based on the protestant reformation and the 30 Years War it really conveys 4 1/2 STARS!!!! Really good read!!! If you like history and historical fiction read this! I probably would have given 5 STARS, but the story has so many characters and is written alternately in each of those characters viewpoints and many various sites it took some effort to keep them all straight. That being said, I'm writing this review after reading book 2 which is even better, having gained a grasp on all the players. Based on the protestant reformation and the 30 Years War it really conveys what an epic struggle took place. It's easy to guess which side is portraying the Catholics and which are the protestants. Let's just say the Empire is not portrayed favorably.. fortunately, I don't have allegiance to either side in this flight!. We get a great feel for all the characters and it is easy to sympathize with many, even sometimes the Empress! Great intrigue and action. Highly recommend! HAPPY READING!!!! I liked the book but was disappointed that my favorite character from the prequel Forsaken Crown Captain Sonnya Vidmar was not featured at all. New characters such as Janna and Commander Braden were welcome. Princess Gwynneth fell short in the character department but came around in the end after it was too late to save the kingdom and her love Prince Kendryck's freedom. Empress Teodora makes an excellent villain. This a well written sword fantasy told through the experiences of several different people.Each has their strengths and weaknesses.A religious question sparks off a rebellion within an oppressed empire. Politics and brute force soon take over. The characters are engaging and ring true. They also go through their own internal changes as their world falls into war. I'm a WeWriWa/8Sunday author, and Christina Ochs' weekly snippets have always blown my mind. To see them put together instead of teasing me? Awesome. A really good, very well planned book with twists and turns I wasn't expecting, and a few moments that really gripped my heart. Definitely for readers who enjoy political tactics, epic battles, and like villains prone to insane temper tantrums! I wasn't so fond of the constantly shifting change of POV at first, but the chapters came so rapid-fire that I wasn't left in suspense for each character for long, and was sucked right in. I'm a bit perplexed with Janna's role, but she has a highly emotional storyline, so I don't mind. Prince Kendryk tries his hardest to protect a beloved religious leader yet branded heretic, Father Landrus. The young prince spends much of the story trying to choose what is convenient for him and what is best for his people. This naturally ruffles the feathers of Empre The novel follows four characters throughout the book: Prince Kendryk, Princess Gwynneth (his wife), Braeden, and Janna. Each chapter takes turns using their perspective to tell the story of a bubbling war and religious conflict. On the other side, you have Janna who loses just about everything in the book. She represents what the common people suffered as a result of war. Braeden is mainly acting on orders to do the fighting and village-burning, even though his heart isn't completely in it. Through their eyes, you wonder who the real tyrant in this story truly is. Ochs gives many character descriptions, especially for Kendryk and Gwynneth, but often you aren't left with much vision clues for the rest of the characters. You often get one brief description and you're left to your own interpretations. There are so many characters that I would have appreciated more references to character appearances. Overall, Christina Ochs delivers an interesting and engaging story of political intrigue, and the choices that have to be made to decipher right and wrong. Ochs shows us the beautiful and ugly side of war through her characters, as well as her extensive knowledge of war strategy, weapons, and politics. Thus, I highly recommend this to anyone interested in history, warfare, and excellent characters. A truly fantastic read. I got so caught up in it I didn't want to put it down. Christina gets right in the middle of the war engaging all around. The characters seem to have a bond going on between them. They are very close as concerns rise. A thrilling plot rhat's easy to read and follow envisioning yourself as part of it. I would recommend reading this to anyone who has visions of a better future. Fantastic story, excellent writing. This book is a page-tuner. Set in the timeframe of the Thirty Years War, this book is made incredible by Christina Och's ability to write scenes that pull the reader in, and to write characters who evoke all kinds of emotions from the readers. The political maneuvering among the royals was endless. Allies and traitors, friends and enemies. Alliances made and broken. And the role that religion played in the war is so well fleshed out, it is fascinating. Book one Fantastic story, excellent writing. This book is a page-tuner. Set in the timeframe of the Thirty Years War, this book is made incredible by Christina Och's ability to write scenes that pull the reader in, and to write characters who evoke all kinds of emotions from the readers. This one is part of a boxed set "Light in the Darkness", several authors with their fantasy stories, and it is one of the better ones. The first in a series that I will continue with. There is violence and sexual content though most content is implied. I give it four stars. I enjoyed it. This is the second book of Chistina Ochs that I have had the please of reading. It starts out a little slow but she builds it up real quick. She definitly knows how to keep a readers attention. I would highly recommend this book to anyone who loves a good sit down and read on a rainy day! Wtf is up with each chapter identifying which character (especially when it's third person written, not first person)? Authors have written better novels for centuries without having to baby spoon feed its readers. I liked it so much,I read all the others! Although I've not started The Foreskin Crown,summer yard work & rent surgery have kept me busy & a new medication made my eyes to blurry to read, let alone drive. My body has finally adjusted to new medication & am seeing better the last 4 days! This is a great story, and incredibly engaging right from the start. The whole book is told from the viewpoint of four main characters, and it is very easy to keep each storyline clear. I loved all of the main characters, and felt they were all super relatable, each on their own level. The threads of each storyline were woven together very nicely and made for a complex and adventurous story. A solid start to a sweeping fantasy saga. I enjoyed the world building, the fast paced action and the characters both good and bad that made up this story. As with many stories of this nature it took a bit to immerse myself in this saga - but once I did I couldn’t seem to put the story down until I’d turned the last page. Get a free ebook of the prequel when you join my reader's group!